Louisa Ulrika of Prussia (Swedish: Lovisa Ulrika; German: Luise Ulrike) (24 July 1720 – 16 July 1782) was Queen of Sweden between 1751 and 1771 by her marriage to King Adolf Frederick, and queen mother during the reign of King Gustav III. Louisa Ulrika was born in Berlin as the daughter of Frederick William I of Prussia and his wife Sophia Dorothea of Hanover, and was thus a younger sister of both Wilhelmine of Bayreuth and Frederick the Great. She was given the Swedish name Ulrika because Queen Ulrika Eleonora of Sweden had been her god mother. [page needed] She exchanged letters with her godmother, and it was thought that she would marry a future son by Ulrika Eleonora, as Ulrika Eleonora herself had once been considered as a consort for Louisa Ulrika's father. [page needed] However, Ulrika Eleonora remained childless. Louisa Ulrika was described as beautiful, intelligent, with a fierce temperament and a strong will. [page needed] She was given an advanced education in accordance with the French age of enlightenment by the governess Marthe de Roucoulle and the governor Maturin Veyssiére la Croze, both French Huguenots. Her intellectual interests were not opposed by her father who, while disapproving in her brothers interest for learning, did not do so in the case of Louisa Ulrika, who was reportedly a favorite of her father. [page needed] She and her eldest brother, the future Frederick the Great, had a reasonably good relationship, sharing their interest in science and culture. Her favorites among her siblings were her younger brother Prince Augustus William of Prussia and her sister Princess Sophia Dorothea of Prussia. [page needed] At the court of her mother, she was introduced to Voltaire, with whom she engaged in a lifelong correspondence, and Maupertuis. Several dynastic marriages were considered for her from 1732 onward, including Frederick Lewis, Prince of Wales, Charles III of Spain and Louis of Hesse-Darmstadt,[page needed] but none came to fruition. She was appointed co-adjutrix of Quedlinburg Abbey with the prospect of becoming a reigning princess-abbess in 1743, a future of which she did not approve. 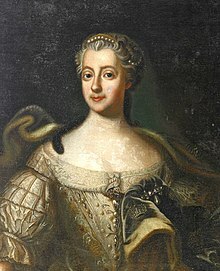 In 1743, an election was held to appoint a crown prince to the Swedish throne, as Frederick I of Sweden was childless, and the French de facto regent, Cardinal Fleury, suggested a marriage between Louisa Ulrika and the French candidate: Christian IV, Count Palatine of Zweibrücken. [page needed] This plans discontinued when Christian lost the election to the Russian candidate, Adolf Frederick of Holstein-Gottorp. 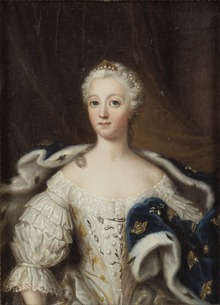 When negotiations were made to arrange a marriage for the newly elected crown prince Adolf Frederick of Sweden, the first candidate for the match was Princess Louise of Denmark. These plans were revoked when a decision was made to create a triple alliance between Sweden, Russia and Prussia through dynastic marriage. 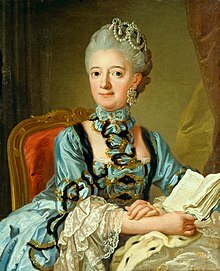 [page needed] The heir to the Swedish throne was therefore to marry a member of the Prussian royal house, while the heir to the Russian throne was to marry Sophie of Anhalt-Zerbst (the future Catherine the Great) who had been selected by Prussia. [page needed] In accordance with this agreement, Louisa Ulrika or her sister Princess Anna Amalia of Prussia were to be selected for the Swedish match. The Swedish envoy in Berlin, Carl Rudenschöld, inspected them and recommended that the proposal be made to Louisa Ulrika. [page needed] Frederick the Great himself preferred Anna Amalia for the Swedish marriage: he described Anna Amalia for the Swedish representatives as goodhearted and more suitable for Sweden, while Louisa Ulrika was arrogant, temperamental and a plotting intriguer. [page needed] It has been suggested that Fredrick's judgment was given because he believed that Anna Amalia would be easier to control as a Prussian agent in Sweden than the strong willed and dominant Louisa Ulrika. 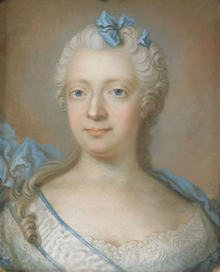 [page needed] After having consulted Adolf Frederick, however, the Swedes chose Louisa Ulrika, and her brother gave his consent on 1 March 1744. She was given tuition about Sweden, was advised not to get involved in politics, and converted to Lutheranism 28 June. 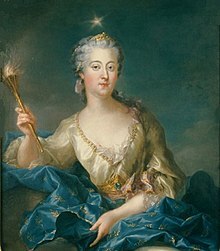 Louisa Ulrika of Prussia as the goddess Aurora by Francois-Adrien Latinville (1747). Lovisa Ulrika by Gustaf Lundberg. On 17 July 1744, Louisa Ulrika and Adolf Frederick were married per procura in Berlin, with her favorite brother August Wilhelm as proxy for the absent groom. She was escorted from Berlin to Swedish Pomerania by the Swedish envoy count Carl Gustaf Tessin, his spouse Ulla Tessin and his wife's niece Charlotta Sparre, who was appointed her maid of honor. In Swedish Pomerania, the entourage was welcomed by the Swedish General Governor of the province and the court of the late queen under the leadership of her Mistress of the Robes, countess Hedvig Elisabet Strömfelt: she kept only her lady-in-waiting Wilhelmine von der Knesebeck and a couple of footmen of her Prussian entourage. Louisa Ulrika was received with enthusiasm in Sweden as the hope for the salvation of succession crisis. At the birth of her first child in 1745, no children had been born in the Swedish royal house in over 50 years and she gained initial popularity with her beauty, wit and interest in science and culture. Carl Gustaf Tessin described her as "the wisdom of a god in the image of an angel",. [page needed] Despite French being her native language, she was tutored in Swedish by Carl Jesper Benzelius and mastered it well after only two years. She studied Swedish literature and gathered a Swedish language library, she corresponded with the Royal Swedish Academy of Sciences and created a nature scientific collection. [page needed] Her arrogant and haughty demeanor, however, eventually made her less popular outside of the royal court. Upon her arrival, she was granted Drottningholm Palace as her summer residence, where the "Young Court", as it was called, amused themselves with picnics, masquerades and French language amateur theater. [page needed] The Crown Prince's court was dominated by Carl Gustaf Tessin, who escorted Louisa Ulrika to Sweden and remained an influential favorite during her years as Crown Princess. [page needed] Adolf Frederick never cared much for Tessin,[page needed] but Louisa Ulrika had him appointed marshal at court and eventually royal governor of her son Prince Gustav. Tessin was behind many amusements in the circle of the Crown Princess, and it was said that he was only too eager to please Louisa Ulrika in any way possible. [page needed] There were unconfirmed rumors that Tessin was the lover of Louisa Ulrika during her tenure as Crown Princess. [page needed] Her son Gustav III later addressed these rumors, that although Count Tessin had been in love with her, his feelings were one-sided and not answered by his mother, as a love affair with a noble contradicted the "natural contempt" which Louisa Ulrika herself as a royal felt for every subject, noble or not. [page needed] Her circle at court included Henrika Juliana von Liewen, who immediately became her favorite among her ladies-in-waiting; the intellectual Cathérine Charlotte De la Gardie, the scientist Eva Ekeblad, and the witty Anders Johan von Höpken. Louisa Ulrika of Prussia by Carl Fredrich Brander. Louisa Ulrika of Prussia by Lorens Pasch the Younger. The year 1754 was the year of the alienation of Tessin. His favor with the Queen had deteriorated since 1750-51: first, when he used the Riksdag to force her to agree to the engagement between Crown Prince Gustav and Sophia Magdalena of Denmark, when she herself had wished to engage her son to Margravine Philippine of Brandenburg-Schwedt;[page needed] and second, when he had betrayed her plans of a coup at the accession of her spouse. The relation between Louisa Ulrika and Tessin was never well seen by Adolf Frederick. [page needed] Contemporary witnesses state the Tessin was in love with her and "was not always able to conceal his feelings for the Crown Princess". [page needed] It is unknown whether there was ever any physical relationship between the Queen and Tessin, but Louisa Ulrika herself mention in her memoirs that she had been offended somehow in that aspect. [page needed] According to Crown Prince Gustav wrote in 1769, that Tessin had made Louisa Ulrika "suggestions far from the reverence one is expected to show toward a sovereign. "[page needed] The Queen felt her pride offended and informed the King, who surprised Tessin on his knees before the Queen. This incident led to the King's animosity toward Tessin and the exile of Count and Countess Tessin from court. [page needed] The queen only remarked that she missed Countess Tessin. The first plan was for the royal couple to travel to Uppsala under the pretext of a visit to Drottningholm Palace. In Uppsala, they would summon the regiments of Närke, Värmland and potentially Uppland as well as the Life Guards and march toward the capital. This plan was aborted because of the King's illness in April 1755. [page needed] To finance the coup, the Queen pawned parts of the Crown Jewels in Berlin. In the three months following her coronation, Louisa Ulrika removed 44 diamonds from the Queen's Crown and replaced them with glass, which she pawned in Berlin as security for a loan by the help of her brother August. [page needed] At this point, rumors reached the Riksdag. A lady-in-waiting of the Queen, Ulrika Strömfelt, who was a loyal follower of the Hats and not a supporter of absolute monarchy, reportedly informed the Riksdag that parts of the Crown Jewels were missing. The 21 June 1756, the royalist Ernst Angel was overheard talking about the plans of a royal revolution while drunk at a tavern. In parallel, one of the royalist officers, Christiernin, attempted to enlist Corporal Schedvin of the garrison in the coup who, however, informed the Hats. On 22 June 1756, the King and Queen left the capital for Ulriksdal Palace to avoid being present during the inventory of the Crown Jewels. That same day, Ernst Angel, Christiernin, Stålsvärd, Puke, Angel and a number of others were arrested. [page needed] During the interrogation, Ernst Angel revealed the whole plot. When the King and Queen returned to the capital that night, the streets were patrolled by militia. [page needed] The members of Hovpartiet were arrested or fled to avoid arrest. In July 1756, seven members of the Queen’s followers were executed. In January 1762, her suggestion of peace with Prussia was accepted in the Riksdag through her bought parliamentarians there, in exchange for a promise not to take revenge on the Hats (party). She was given the official assignment from the Riksdag to handle the peace negotiations with Prussia and secure that Sweden could keep Swedish Pomerania, a task she performed successfully, and she was officially thanked by the Riksdag for her service to the state in May. [page needed] As a sign of gratitude for this act, the government paid her debts, which made it possible for her to use her money to affect the voting in the Riksdag through bribes. During the Riksdag of 1765, the Queen attempted to balance the Caps and the Hats by creating a third party of her followers from both parties under her follower Malmstein, which she managed to have elected vice speaker. [page needed] The election to the Riksdag of 1765 was won by the Caps party. By demonstrating how she could affect the votes in the parliament through her third party, she was able to secure her alliance with the Caps. [page needed] She also summoned the Ambassador of Russia to Kina Slott to secure support from Russia and its ally Denmark. [page needed] When the question of the Constitution was finally raised in the Riksdag in August, however, the Caps refused to accept an increased royal power and instead limited the power of the Crown even more. [page needed] With this, her efforts failed once again. 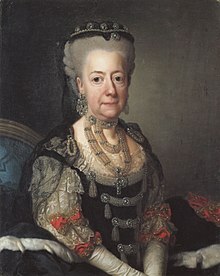 Louisa Ulrika of Prussia as Queen Dowager by Lorens Pasch the Younger. Lovisa Ulrika, by Alexander Roslin, 1775. 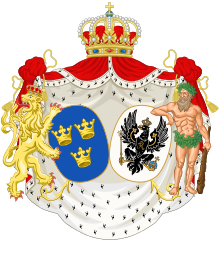 Marital coat of arms of Louisa Ulrika as Queen of Sweden, showing the arms of Sweden and Prussia respectively. In 1771, the King died and she became Queen Dowager. By this time Louisa Ulrika was immensely unpopular in Sweden. When the news of the old King's death reached her son, the new King Gustav III of Sweden, who was then in Paris, he wrote that the Queen Mother be protected, as "I know how little loved my mother is". Louisa Ulrika could, however, never settle with the position of Queen Dowager. She had expected to be the real ruler behind the throne, and when her son made it clear that he would rule independently from her, their relationship worsened. [page needed] In 1772, he prevented her plans to marry off her second son Charles to Philippine of Brandenburg-Schwedt, and in 1774, Charles was married to Hedwig Elizabeth Charlotte of Holstein-Gottorp instead. [page needed] Gustav III paid her debts with the condition that she established her own separate court at Fredrikshof Palace. [page needed] In 1777, she was forced to sell Drottningholm Palace to her son Gustav. In 1777-78, the conflict with her son erupted and she was a central figure in the great succession scandal regarding the legitimacy of the Crown Prince. In 1777, her two younger sons, Charles and Frederick Adolf, visited her. They claimed all women at court had lovers, and that with the exception of their mother, they could not think of even one who did not. [page needed] Louisa Ulrika suggested that surely the Queen must also be an exception. In reply, her sons laughed and asked her if she had not heard of the rumors that Sophia Magdalena had an affair with Fredrik Munck. She became very upset and ordered Prince Charles to investigate if this were true, as his inheritance to the throne would be endangered by "the common offspred of a common nobleman". Charles talked to Munck, Munck talked to King Gustav, Gustav talked to Charles who claimed the whole thing was the fault of the Queen Mother, which resulted in a great conflict between mother and son. When the son of the King was born in 1778, rumours circulated that he was the son of Munck. Louisa Ulrika accused the King of having another man father his child. A great scandal erupted, during which the King even threatened to exile her to Pomerania. In the following conflict, her youngest children, Sofia Albertina and Frederick, who had always been her favourites, took her side against the King. Louisa Ulrika was forced to make a formal statement, during which she withdrew her accusation. The statement was signed by the entire adult royal family except the royal couple; two princes, the princess, the Duchess, and six members of parliament. The relationship with Gustav was not repaired until she was on her deathbed. She died in Svartsjö. Jonsson; Ivarsdotter, Anna, eds. (1993). Musiken i Sverige. 2, Frihetstid och gustaviansk tid 1720-1810 [Music in Sweden. 2, The Age of liberty and the Gustavian Age 1720-1810] (in Swedish). Stockholm: Fischer. ISBN 91-7054-701-7. LIBRIS 8221450. Hadenius, Stig; Nilsson, Torbjörn; Åselius, Gunnar (1996). Sveriges historia: vad varje svensk bör veta [The History of Sweden: What every Swede should know] (in Swedish). Stockholm: Bonnier Alba. ISBN 91-34-51784-7. LIBRIS 7247694. Jägerskiöld, Olof (1945). Lovisa Ulrika [Louisa Ulrika] (in Swedish). Stockholm: Wahlström & Widstrand. LIBRIS 8074766. Lindgärde, Valborg; Mansén, Elisabeth, eds. (1999). Ljuva möten och ömma samtal: om kärlek och vänskap på 1700-talet [Sweet encounters and tender conversations: about love and friendship in the 1700s]. Litteratur, teater, film, 0347-7770 ; N.S., 20 (in Swedish). Stockholm: Atlantis. ISBN 91-7486-038-0. LIBRIS 7644234.